German city; capital of the grand duchy of Baden. Jews began to settle there soon after its foundation (1715) by Margrave Carl Wilhelm of Baden-Durlach; they were attracted by the numerous privileges granted by its founder to settlers, without discrimination as to creed. Official documents attest the presence of several Jewish families at Karlsruhe in 1717. A year later the city council addressed to the margrave a report in which a question was raised as to the proportion of municipal charges to be borne by the newly arrived Jews, who in that year formed an organized congregation, with Rabbi Nathan Uri Kohen of Metz at its head. A document dated 1726 gives the names of twenty-four Jews who had taken part in an election of municipal officers. As the city grew permission to settle there became less easily obtained by Jews, and the community developed more slowly. In 1750 there were seventy-five Jewish families in Karlsruhe; in that year Nathan Uri Kohen died, and was succeeded in the rabbinate by Jacob Nathanael Weil, who held the office until 1769. 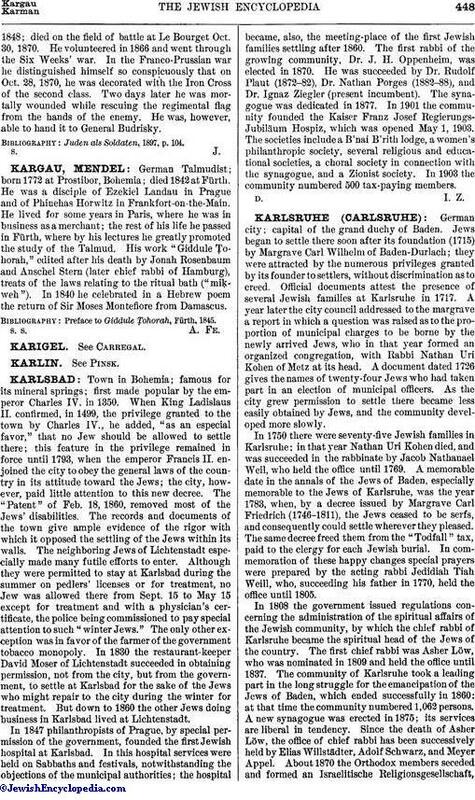 A memorable date in the annals of the Jews of Baden, especially memorable to the Jews of Karlsruhe, was the year 1783, when, by a decree issued by Margrave Carl Friedrich (1746-1811), the Jews ceased to be serfs, and consequently could settle wherever they pleased. The same decree freed them from the "Todfall" tax, paid to the clergy for each Jewish burial. In commemoration of these happy changes special prayers were prepared by the acting rabbi Jedidiah Tiah Weill, who, succeeding his father in 1770, held the office until 1805. In 1808 the government issued regulations concerning the administration of the spiritual affairs of the Jewish community, by which the chief rabbi of Karlsruhe became the spiritual head of the Jews of the country. The first chief rabbi was Asher Löw, who was nominated in 1809 and held the office until 1837. The community of Karlsruhe took a leading part in the long struggle for the emancipation of the Jews of Baden, which ended successfully in 1860: at that time the community numbered 1,062 persons. 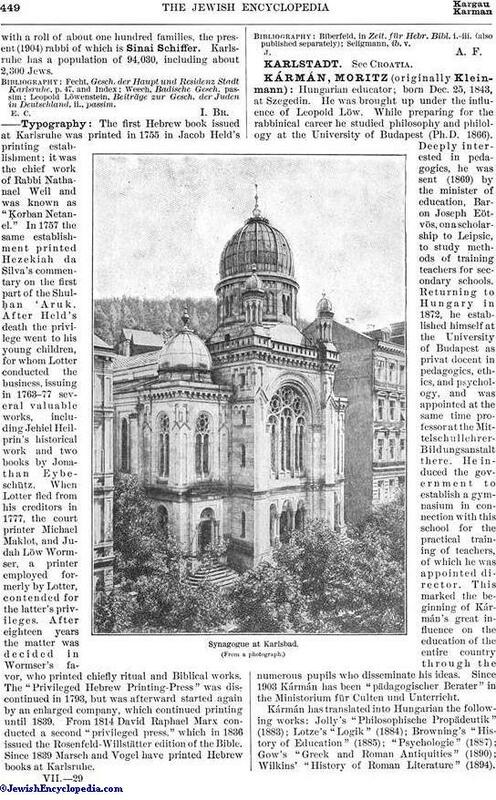 A new synagogue was erected in 1875; its services are liberal in tendency. Since the death of Asher Löw, the office of chief rabbi has been successively held by Elias Willstädter, Adolf Schwarz, and Meyer Appel. About 1870 the Orthodox members seceded and formed an Israelitische Religionsgesellschaft,with a roll of about one hundred families, the present (1904) rabbi of which is Sinai Schiffer. Karlsruhe has a population of 94,030, including about 2,300 Jews. Leopold Löwenstein, Beiträge zur Gesch. der Juden in Deutschland, ii., passim. The first Hebrew book issued at Karlsruhe was printed in 1755 in Jacob Held's printing establishment; it was the chief work of Rabbi Nathanael Weil and was known as "Ḳorban Netanel." In 1757 the same establishment printed Hezekiah da Silva's commentary on the first part of the Shulḥan 'Aruk. After Held's death the privilege went to his young children, for whom Lotter conducted the business, issuing in 1763-77 several valuable works, including Jehiel Heilprin's historical work and two books by Jonathan Eybeschütz. When Lotter fled from his creditors in 1777, the court printer Michael Maklot, and Judah Löw Wormser, a printer employed formerly by Lotter, contended for the latter's privileges. After eighteen years the matter was decided in Wormser's favor, who printed chiefly ritual and Biblical works. The "Privileged Hebrew Printing-Press" was discontinued in 1793, but was afterward started again by an enlarged company, which continued printing until 1839. From 1814 David Raphael Marx conducted a second "privileged press," which in 1836 issued the Rosenfeld-Willstätter edition of the Bible. Since 1839 Marsch and Vogel have printed Hebrew books at Karlsruhe.